Here today and gone tomorrow, many of today’s trendy kitchen fads will leave you regretting your decision a couple of years down the road. There are classic kitchen renovations and then there are trendy kitchen renovations. More classic options help your renovations remain relevant longer. Kitchen renovations are far from cheap. 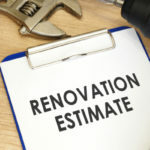 It’s important to ensure every decision you put into your remodel is something you’ll be happy about in the future. Microwaves have been placed over the oven range for years, and many people still request it. It looks good and may serve functional for your family. If you’re positive that’s where you want the microwave (and you’re not selling your home any time soon), go for it. BUT… you must be warned that this trend is on the outs. People are now opting to install microwaves in more family-friendly locations, like in a cabinet that everyone can easily reach. In the early 2000s, it seemed everyone wanted to add a built-in desk to the kitchen. In premise it sounds like a good idea, but as many people quickly discovered, kitchen desks don’t get much, if any, use. Instead, they tend to fill up with clutter and turn into wasted space. Skip the desk and use that space for something more kitchen-friendly, like a butler’s pantry or additional cabinets. Current kitchen trends are all about metals, but according to leading kitchen designers brass hardware is out. Aim instead for hardware such as satin nickel or brushed nickel. Distressed cabinets might seem like a grand idea when designing a country-style kitchen. Beware though, this look is on the outs and won’t make it any easier to sell your home when they time comes. More modern cabinets include refreshingly bright pops of paint and classic wood tones. 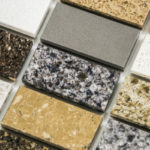 Quartz countertops are beautiful but they are also hard to maintain and do not have the same durability as granite. 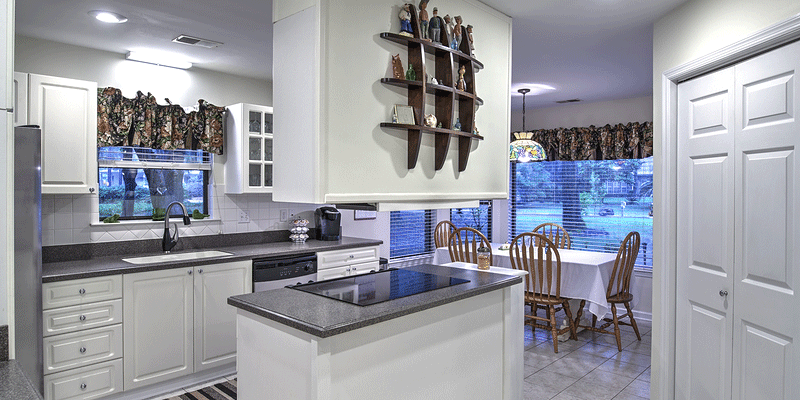 You can actually buy granite that very closely resembles quartz without the high price point and added sensitivities. For a rather short time kitchens were being designed with petite backsplashes. 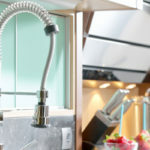 Yet, people are quickly realizing that stains and spills often overshoot a small backsplash, which makes cleaning a pain. It may cost a little bit more to extend the backsplash up higher on the wall but you’ll be thankful for it later. The open and airy feel reminiscent of loft living has caused many to skip out on window treatments. We don’t recommend following along with this trend. Window treatments were invented because they serve an important purpose—they provide privacy and shade when the sun is cooking up outside. 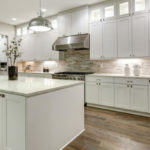 There are plenty of minimalist options out there if you want to keep the look of your kitchen more modern without having to skip out on all of the benefits of window shades and blinds. Stoves, ranges and other appliances in fun shades of coral, green or pink can be found all over the place these days. If it’s something you must have and think you’ll love forever, we are not here to stop you. But know this: This trend will end and then you’re going to have a bright green stove to contend with. Going for brightly colored blenders, mixers and other smaller, more affordable appliances is a great way to take care of your craving for color without going overboard and regretting your decision later. Okay, we are a little torn on this one because when done right two-tone kitchen cabinets can look pretty impressive. Also, they are a more recent trend that could have as much as 15-20 years of ‘cool appeal’ before going on the outs. Plus, you can always repaint them if the trend dies out. All that being said, brand new cabinets are likely to outlast the trend of two-tone cabinet colors. There are certain parts of the kitchen that are okay to play around with and get trendier with. For instance, lighting fixtures, smaller appliances and furniture are all things that can be easily swapped out or painted as trends come and go. On the contrary, if you get extra trendy with your flooring, countertops, cabinets or larger appliances you are going to have a lot tougher time getting rid of them when the glory of that particular style fades.